The video monitoring software that's used by some of the world's top security forces is now available for your business. Whether it’s for keeping an eye on if people are where they say they are, or checking that no-one is taking something they shouldn’t, you need a video monitoring app that is hassle-free and cost-efficient. Sighthound Video offers extremely powerful software that’s easy to use and set up. Best of all, you don’t need to take our word for it. Download it here now and get a fully-featured trial of the Pro version. If it’s not the best video monitoring software you’ve tried, write and tell us what we should do to earn your business: feedback@sighthound.com. Use the rule editor to set custom rules and receive more meaningful alerts. Most business owners don’t have time to watch a live feed of events as they unfold at work. Is something missing from a stock room? Tell Sighthound to look back at a doorway between the hours of 6PM and 8AM and you’ll get a list of search results, each with a video clip. Or get alerts if someone enters the stockroom after work hours. Worried that an intruder might take the computer? Have sighthound automatically save clips off to the cloud or other file server. Sighthound Video tracks people. It can also be given specific rules, such as record a clip when a person walks through a doorway. 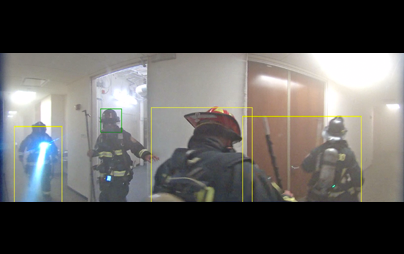 There is a very powerful, yet easy to use intelligent video search capability. You can even look for certain times on certain days to see when people arrived or left. Late one evening there was a fire at the Sighthound office in Orlando. We quickly searched the Sighthound Video feed from our office and counted that everyone was safely out. We also watched the firefighters doing a fantastic job of searching the building and putting out the fire.